President Barack Obama travels to Cuba Sunday, becoming the first American leader to visit the communist-ruled island nation in almost 90 years. 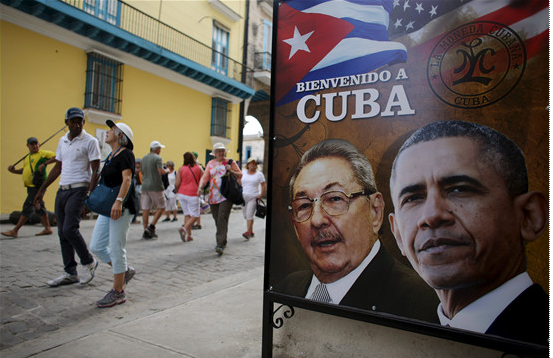 Obama administration officials say the president will meet with Cuban President Raul Castro on Monday. He will meet with members of Cuban civil society, including human rights activists, and will give a speech to the Cuban people on Tuesday. Ted Henken is a professor at Baruch College in New York. He has written about Cuba. He will be in the country during President Obama's visit. He told VOA that the president is traveling to Cuba to ensure that relations between the United States and Cuba are not reversed when he leaves office. Henken said that Obama wants to speak directly to the Cuban people. Henken added the president will meet and talk with whom "he chooses and not just with whom the government wishes him to meet with only." He said that the president and his aides will work to convince Cuban officials to change their policies. He said they will not stop pushing for the nation to accept the American values of democracy and respect for human rights. But Henken said "the president has made it very clear that it is the Cuban people who should and who will decide their future, and the United States will not be making demands on anyone in Cuba, but will be communicating a message of friendship, of assistance, of solidarity." Henken said Obama will also explain to the Cuban people that the United States is not the reason for the island's poor economic conditions. After his trip to Cuba, Obama will travel to Argentina. In his final months in office, he will also visit Canada and Peru. The bus travels to and fro between London and Brighton. He leaves his office job to try to make a living on the land. 1.Henken added the president will meet and talk with whom "he chooses and not just with whom the government wishes him to meet with only." He looks like he's got an axe to grind. Better have a talk with him. You can talk with my deputy during my absence. 2.He said they will not stop pushing for the nation to accept the American values of democracy and respect for human rights. People living near the airport are pushing for new rules about night flights.